It took almost 30 years until someone applied some of the multitude of the camera and cinematographic techniques of Dziga Vertov in “Man with a movie camera” into a film with storyline. That one surprisingly came once again from Russia and was Mikhail Kalatozov who masterfully from the start to end used camera, cinematography, hence the powerful visual effects of cinema into a gripping melodrama. “The Cranes Are Flying”, a sweet love story in blooming, withers by the start of invasion of the Nazis to Russia, along with the loss of many other dreams, hopes and lives. 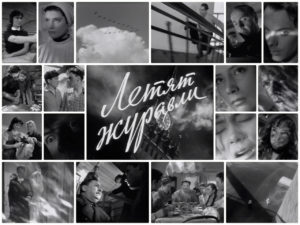 The only Soviet film to win the Palme d’Or, the grand prize of the Cannes Film Festival, was written by Victor Rozov, cinematography by Sergey Urusevsky and Mikhail Kalatozov and the music score of Moisey Vaynberg. Unfortunately film itself not as much as the film’s main protagonist, Tatyana Samojlova who played the role of Veronika, the young beautiful broken hearted lover attracted the attention of the western critics and millions of Europeans at the time. The Georgian Mikhail Kalatozov changed many professions before starting his film career as an actor and later on a cinematographer, before directing films. He first experimented his talent in several documentaries before creating his first major feature, “The Cranes Are Flying”. Then he made a few others, “The unsent letter” (1959), “I Am Cuba” (1964), and “The Red Tent” (1969). Surprisingly and despite its great win at the Cannes’, the film was mostly an accolade even by the critics for its sensitive and heart breaking story, the captivating beauty, gentleness and superb acting of Tatyana Samojlova, and not much for its great filmmaking. The simple free hand-held camera and cinematographic work of Sergey Urusevsky is an exemplary piece of filmmaking. 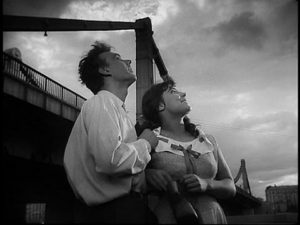 The film opens with un-feared well-fed extreme camera shots from different angles, long and close up like “Man with a movie camera”, but not for a cinematic experiment, but conveying emotions and the love relationship of a young couple, Veronika (Tatyana Samojlova) and Boris (Aleksey Batalov). Right from the start we see how the camera and cinematography used to portray feelings, first joy and happiness, then loss, failure, guilt, disappointment, disgust, confusion, hatred, humanity, belonging, dedication and more. The camera work and cinematography like the tempo and the emotions in the film is uninterrupted all the way from the start to finish, with the acting and music score all complement each other. Of the acting certainly the role of Tatyana Samojlova is surpassed any criteria and is a rarity on the screen. It is not just her beauty that captured the audience and critics’ accolade, but her acting is so natural, genial and compassionate without any added pretension that reminds one of Renee Jeanne Falconetti in the “Passion of Joan of Arc” in the silent era. She acts in silence when in despair of not being able to farewell with her lover Boris, or in angst when not hearing from him in the front, and finally learning of his death, all seen and felt from her facial expression in silence. At the time of joy and excitement, she acts like a kid free of any boundaries, and at the time of anger, she bursts with no hesitation out of control. 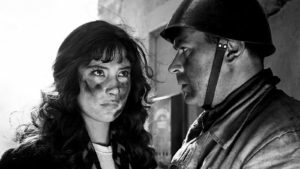 The camera, cinematography, the music score, directing and the beautiful gentle acting of Tatyana Samojlova are all at the service of a love story Shattered by the cruelty of the war. Boris despite the wish of Veronika and his family volunteers to fight for his homeland. He departs for the front on the birthday of Veronkia, not able to say farewell face to face. The scene of volunteer privates farewell to their family and beloved ones, while first Boris then Veronika who arrives to the scene late, looking for each other in vain, is a memorable scene well filmed. One night of the bombardment of the city, Veronika’s parents refuse to go the hiding in subway, and when she gets home, finds the whole house in ruin, fire, smoke and all dead. With bravery climbing the stairs to their apartment in the smokes, fire and debris is another unforgettable scene of filming and acting with its powerful music score. She climbs upstairs in a fury, still with the hope of rescuing her parents, but when opens the door, all’s gone to the ruins, the floor open to the street down, while a pendulum clock is still ticking. This is a farmable scene to be learnt for future adaptation. The look on the face of Veronika that shows emptiness, hope and dream all gone without any words, but a silent scream is a moment of dread and admiration. From then on and for a while the depth of loss of Veronika is only felt through her artfully played silence with still photography of her stare to an unseen far. While the film has a fast tempo of filming and editing with its collaborated music score, it has also admiring scenes of still camera work. Veronika who has been offered to stay with Boris’s family, is asked by Boris father from Mark, Boris’ cousin to take care of her in the absence of Boris. Another night of bombardment, Veronika refuses to go to hiding in spite of the insistence of Mark, a musician who then plays a fast piece on his piano to distract her from hearing the siren and the sounds of bombardment outside. 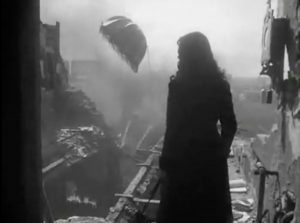 This scene acoustically and visually again with the silent look of Veronika and her stare to the unseen, in an atmosphere of fright and despair is laudable. Finally a wave of bombardment crushes the window of the apartment that frightens Veronika who jumps off her seat into the arms of Mark in a corner of the room. This dreadful scene with continuous flashing of the bombings into the dark room, with the movement of the curtain was a rarity on the screen until then. Mark who always loved Veronika and was jealous of Boris, takes the advantage of the situation and tries to kiss her. 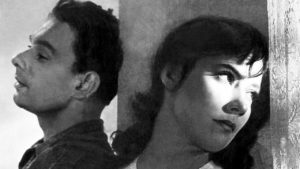 But fateful Veronika and still in Love with Boris slabs Mark on face several times out of anger and surprise, resisting and pushing him away. But Mark keeps chasing her around the apartment and pushes himself on her, despite her keep smacking him, until Veronika finally passes out of helplessness, still with eyes open. 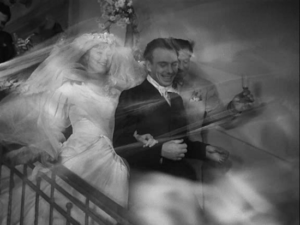 The scene of Mark lifting her up in his arms, walking on the broken glasses towards the bedroom, is elegantly juxtaposed with the steps of soldiers on a swamp in the Warfield. Meanwhile Veronika who has been apparently raped by Mark at the night of bombardment, is forced to marry him. Boris family all are in shock and anger of the betrayal by Veronika, not knowing what had happened. Trying to save his wounded comrade in the war, Boris gets shot and dies in a sudden surprise to the audience and to himself. Another memorable and well filmed scene, Boris in his own sudden surprise of being shot, stands for a while, holding to a tree, while his wounded comrade on the ground, shouting for help. The trees are spinning while Boris is the witness to his own downfall and demise, in his twilight dream running upstairs of Veronika’s apartment like before, but this time in his army uniform. The door opens and he sees himself and Veronika in wedding, with her exalted to have him finally as her wedded man. The scene of wedding and joy of family and friends with many frames overlays continues and finishes back with the spinning trees and the final downfall of Boris on the ground. Frame by frame the film is technical, innovative and masterfully done with no excess. Still no news of Boris from the front despite continuous effort of Veronika to find out, that finally he is declared missing. Now helping in a military hospital along with Boris’ father, who is a physician, one day when a soldier screaming out of control when finds out that his fiancé has married to another, brings flashback to Veronika of her own betrayal. Saddened with the guilt, she runs out with the thought of ending her life. 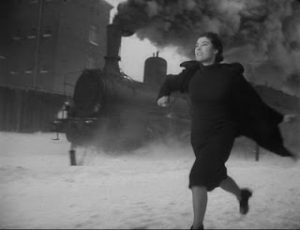 Her fast run to catch a running train to throw herself in front, is the fastest moment of the film, with superfast photography and editing, reminiscent of “Battleship of Potemkin” of Eisenstein. About to jump off a bridge in front of the train under, that the brakes of a car interrupts her when a young boy was about to be run over. Veronika jumps off and rescues the boy and when asks his name, she is surprised to learn to be Boris. She takes the young Boris whose parents are missing, to her place in a community home for the war stricken families. Soon she learns that Mark, her husband who often parties without her, has taken Boris’s last birthday gift, a squirrel (he used to call her such) with him as a gift to another woman in a party. She runs out and confronts Mark in the party and grabs her squirrel and for the first time finds Boris’ last message for her that she had not noticed until then. The letter greets her birthday and regrets that he had to depart her for the war to defend his homeland and hope some day soon they will be together and that he loves her. Meanwhile Boris’ father finds out that Mark has not been exempted from going to war because of his musical talent, but that he himself has cheated a request in the name of Boris father from authorities to be exempted. Here Veronika decides to leave the marriage and the house that Boris’s father asks her to stay. Soon the wounded soldier whom Boris rescued, but he was shot instead, returns from the war asking for his family who were not home at the moment. The soldier tells her that Boris has been killed, as he thought of her not being a relative, but when she tells him that she is his girl, the soldier in surprise and admiration, lifts up her soapy hand while she was washing clothes and kisses it out of respect. Veronika is still with the hope of Boris not being dead and come back to her. On the homecoming march of the returning soldiers, we see Veronika like many others with bouquet of flower in hand to receive Boris. She meets Boris friend, Stepan who confirms Boris’ death and hands her another bouquet of flower. Desperate and in tears, all her hopes are gone, she keeps walking among the joyous crowds when she hears Stepan on the top of a tank salutes all the lost soldiers who were not there to be welcome home. Then she starts passing her flowers one by one to the other soldiers. The film like the opening scene ends with the fly of a flock of cranes in the sky above, when Boris’ father comes to her and they walk home. 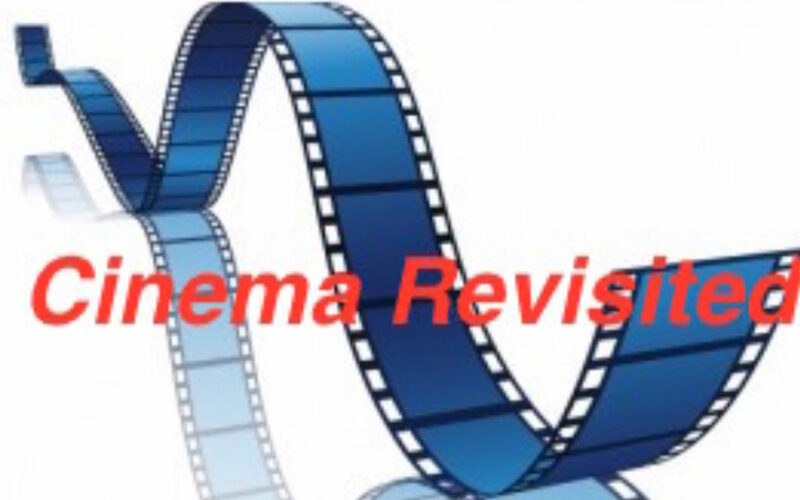 Originality:“The Cranes Are Flying” is the application of “Man with a movie camera” within a film with a gripping war melodrama. Still original in many of its technicality, it weaves well with the acting and music score, creating several original scenes never seen before. Technicality:The technicality of “The Cranes Are Flying” as detailed above is in its uninterrupted frame by frame amazing camera work, cinematography and music score from the start to finish. The film is one of the rare films in the history of cinema with so many application of cinematic techniques. The silent demeanor acting of Tatyana Samojlova joint with the still photography is another admirable technicality of the film. Impact Factor:The influence of “The Cranes Are Flying” has been implicitly on many films and filmmakers as its traces are seen in many other films in later years. 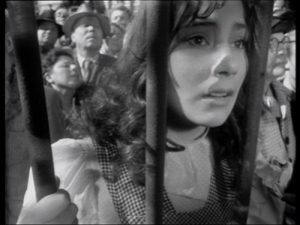 Survival:“The Cranes Are Flying”has survived well to this very day as it could be seen, admired in surprise for the power of cinema over 60 years ago that has been already lost for long.